The manager’s tough start to life at Old Trafford is reflected in many of these facts. 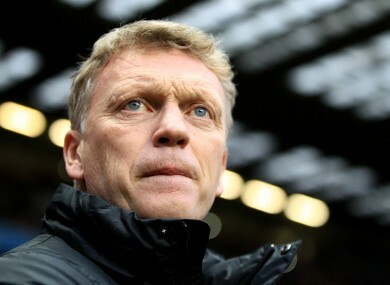 Moyes has come under fire for his side's poor recent form. IT’S BEEN A difficult start to life at Manchester United for David Moyes, and the majority of these statistics reflect that fact. A few, however, such as the comparison with Ferguson’s early tenure, constitute faint signs of hope for the Old Trafford faithful. So far, David Moyes has a better win% record (57.58) than any manager in United’s history apart from Alex Ferguson (59.67). Moyes’ win% with Everton was much lower though (41%). Moyes won 18 of his first 31 games in charge at United — a better record than Sir Matt Busby (15), Ron Atkinson (14) and Sir Alex Ferguson (12). United have gone out of the FA Cup at the third round under Moyes — something which only happened once in Alex Ferguson’s 27 years in charge. United are currently seventh. They haven’t been as low at this stage of the season since the 1988/89 campaign. Only Arsene Wenger, Alex Ferguson and Harry Redknapp have managed more Premier League games than David Moyes. Moyes’ expensive £27.5 million signing, Marouane Fellaini, has scored just once this season — while playing for Everton. He has failed to score in any of his eight appearances for United. United had 202 shots and 33 goals after 20 games this year, compared with 245 shots and 50 goals after the same amount of games last year. By comparison, Man City’s record reads 265 shots and 57 goals. United have won no points from goals scored within the last ten minutes of games (aka ‘Fergie time’) this season, compared with 11 points by this time last season. They have already lost more games in the league under Moyes this season than in the past three full seasons under Ferguson. On average in the Premier League era, United took 45 points from their first 20 games, whereas this season, they took just 34. Before taking over Man United, Moyes had the 18th best managerial win% of managers who had played 20 games or more in the Premier League era. David O’Leary, Roy Evans, Kevin Keegan, Bruce Rioch and Gianluca Vialli were among those who had superior records to him. United meet Chelsea at the weekend, with Mourinho having just dropped four points out of a possible 21 against Moyes, while the Portuguese boss has also never been beaten by his Scottish counterpart in the league. Man United are the third most patient club in the history of English football when it comes to maintaining managers (hiring a new manager every 5.9 years on average), with only West Ham (7.47 years) and Arsenal (6.11 years) more patient. This season, Southampton, Swansea, West Brom, Aston Villa, Norwich, Sunderland, West Ham and Man United have had an average of 12–13 shots per game. By comparison, Everton, Arsenal and Newcastle have had 15 shots per game, while Man City, Tottenham, Liverpool and Chelsea have had 16–17.5. United have experienced their worst home league form for over a decade under Moyes — they’ve also lost at home to Swansea for the first time ever, to West Brom for the first time since 1978, to Everton for the first time since 1992 and to Newcastle for the first time since 1972.
h/t orange.co.uk, Telegraph Sport, Talksport, Paddy Power, OptaJoe, Sportingly Better, statsbomb.com. Email “16 interesting statistics about David Moyes’ Manchester United”. Feedback on “16 interesting statistics about David Moyes’ Manchester United”.